An application to develop a floating wind farm off the coast of Stonehaven has been approved by Scottish Government ministers. The green light has been given to Kincardine Offshore to build the world’s largest floating wind array, consisting of up to eight 6MW semi-submersible turbines, which will operate 15km off the coast of Kincardineshire. 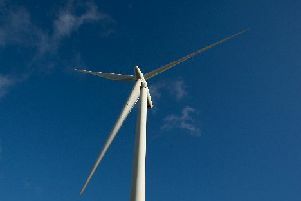 The first turbine of the 50MW array is expected to be on site in the second quarter of 2018. Director of the project, Carlos Barat, said: “This is a significant development not just for Kincardine Offshore, but for the offshore renewables sector in Scotland, the wider UK and across Europe. The development will support the creation of around 110 jobs during assembly, installation and through ongoing operations and maintenance activities. It will also prevent CO2 emissions of more than 94,500 tonnes per year. Lord Nicol Stephen, a director of Kincardine Offshore, said: “Receiving consent is an important milestone for this project and will maintain Scotland’s position as a leading innovator in offshore renewables. John Robertson, Senior Manager at The Crown Estate in Scotland, said: “As an active seabed manager which awards and manages rights for projects such as this, The Crown Estate works with partners to support offshore renewables. Construction activities will start in the summer. Power will be brought ashore to an Aberdeen operations centre and will connect to the grid at Redmoss sub-station in summer 2018. Lindsay Roberts, Senior Policy Manager at Scottish Renewables, said: “Scotland is home to approximately 25% of Europe’s offshore wind resource and we are now starting to build out projects which will harness this potential. “We’re also at the forefront of innovation in this exciting sector and projects like this one are part of a new chapter for our renewable energy industry. North East Labour MSP Lewis Macdonald welcomed the decision. The floating development by Kincardine Offshore Windfarm Limited will create 110 new jobs and will have a generating capacity of up to 50 MW – enough to power over 50,000 homes. “This is great news for the North East, and the creation of new jobs in offshore energy will be welcome at what is a difficult time for the whole region. “Following the approval last year of a floating wind farm off the coast of Peterhead, and the planned Aberdeen Bay Wind Farm, Aberdeen and the North East have the potential to become the offshore renewable energy capital of the North Sea region, as well as the oil capital of Europe.